The Manager's Assistant™ is a high efficiency bookkeeping system designed primarily for the auto and truck service industry. Designed specifically for non-bookkeepers (let alone non-accountants), all functions are easy to use and easy to understand. It has two objectives: To provide the information to your accountant so he can prepare financial statements and tax returns, and to tell you what's going on with your business and where you're at. Your accountant takes all of the financial information from your business from two major sources; sales reports and checkbooks. This system can include both. The checkbook function which can work with two checking accounts. It writes the checks or you can enter the information from your hand-written checks after-the-fact. It tracks payments made up to 500 different payees and computes pay checks. For larger operations, an optional Cash Management, Open Item Accounts payable function is available. Accounts payable can be tied directly to receiving parts. The system will track your expenditures (including cash payment) using up to 1000 different categories (general ledger accounts). Expenditures made on each check may be divided among as many as twelve different categories. With all checks recorded, the system reconciles your bank accounts in minutes. The sales reporting function is built around a mini-trial balance. This verifies that all bookkeeping is correct. The idea is this: Add the sales for the day to the amount collected on house charge accounts. That total should equal the bank deposit for the day plus the sales on house charge accounts, plus cash spent that day for things like coffee, UPS charges, parts, cleaning supplies, etc. These two amounts MUST be equal. If not, something is wrong. If the trial balance is in balance, everything is correct. Even house charge accounts are right! Since the month is just an accumulation of the trial balances made during the month, then at the end of the month the information you give your accountant gets 100% accurate! The trial balance may be done daily or periodically. 24 hour operations can balance as often as four times a day. The Business Analysis Report is a thumbnail sketch of your business. Like a Profit & Loss Statement it tells you how much money you've made so far. Unlike a Profit & Loss Statement it projects sales, tells you how much profit you are going to make, compares actual sales to your current business plan or sales goals, shows your checking account balances and the total owed to you by your charge customers. As sales are recorded through the trial balance function, the sales dollars are divided among as many as 10 categories (departments). Sales are also accumulated by the week, month and year. Charge sales automatically appear on the customers charge statement. The system will print statements for as many as 1000, charge accounts. Selected customers may be billed on an Open Item or Balance Forward basis. Delinquent accounts may be assessed a service charge. The percentage may be different for all accounts and any account may be excluded from service charges. All accounts are aged for up to 6 months. Employee sales are also monitored. Commissions due employees are automatically calculated. Each employee can have a different commission plan. His commission may be calculated differently depending on the function they perform such as an installer and a salesman. For the purpose of calculating commission, each employee can function as an installer and as a salesmen at the same time! By using the built-in Payroll function the calculated commission can automatically appear on the employees' pay checks. A built-in report generator allows the printing of more that one hundred different reports which can be customized to meet the needs of the moment. Operators who have a display of fast moving impulse items will appreciate the built-in mini perpetual inventory system that can handle up to four dozen items. This is also useful to control expensive items on display such as tires and batteries. In order to make The Manager's Assistant™ as usable in service stations, we have available a complete gasoline module. It automatically converts stick readings to gallons, balances the storage tanks, recommends a gas order, handles all types of dispensers and consoles, and gives a comprehensive pool margin analysis (weighted average margin). As many as four shifts per day may be entered. The system generates a master daily report by combining all shifts entered for a day. The system can also gather the necessary information when using the "Retail inventory value method" in convenience stores. The Manager's Assistant™ may be used in combination with The Service Manager™ and Precision Parts Manager. 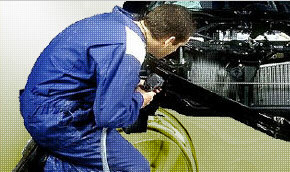 It directly integrates with Computerized Automotive Repair order Systems (C.A.R.S. ).